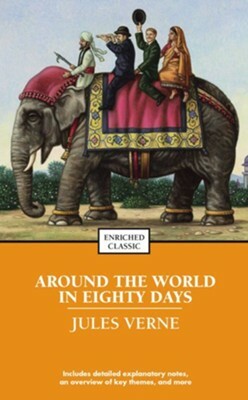 Jule's Verne's classic tale of world traveling has inspired many an imagination; from resucing women in India to discovering the American West, this thrilling story of a gentlemen's wager has been well-loved for years. Explore this story even further with the Enriched Classics detailed explanatory notes, overview of key themes, glossary, critical analysis, discussion questions and more. 266 pages, softcover. After making an audacious wager, the wealthy and eccentric Phileas Fogg attempts a seemingly impossible feat -- to circumnavigate the globe in eighty days. Jules Verne (1828-1905) was born in France. Around the World in Eighty Days has long been his most popular novel. Verne is credited with creating the genre of science fiction with such other works as Journey to the Center of the Earth and Twenty Thousand Leagues Under the Sea. I'm the author/artist and I want to review Around the World in Eighty Days - eBook.